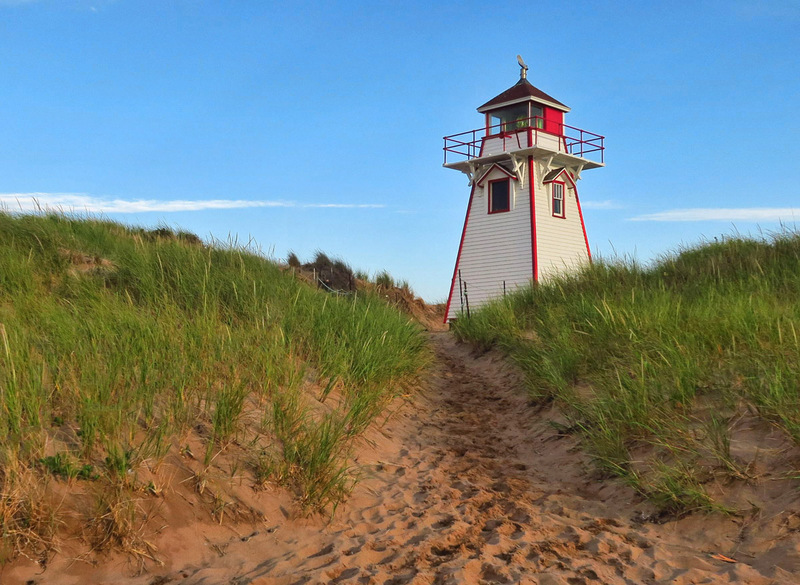 As I see it, there are four areas of interest in visiting Prince Edward Island. 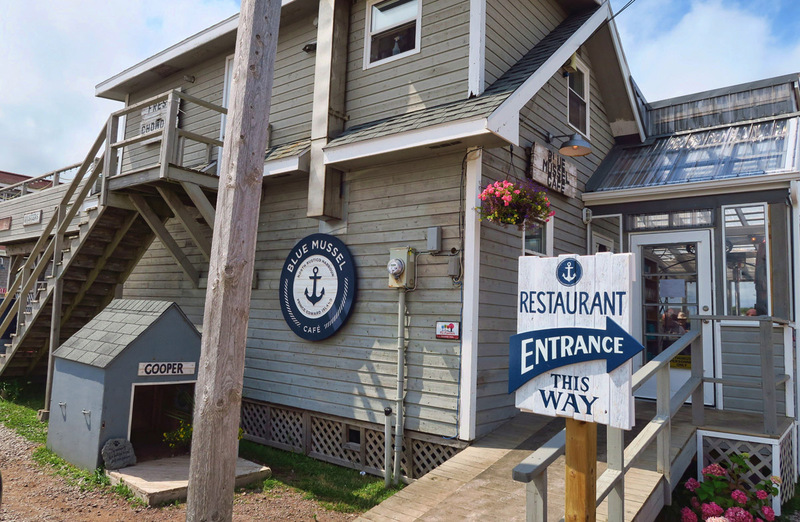 First, they are known the world over for their mussels…any seafood restaurant or raw bar worth its seasoning will at some point feature “PEI Mussels” on the chalkboard as a special of the day. 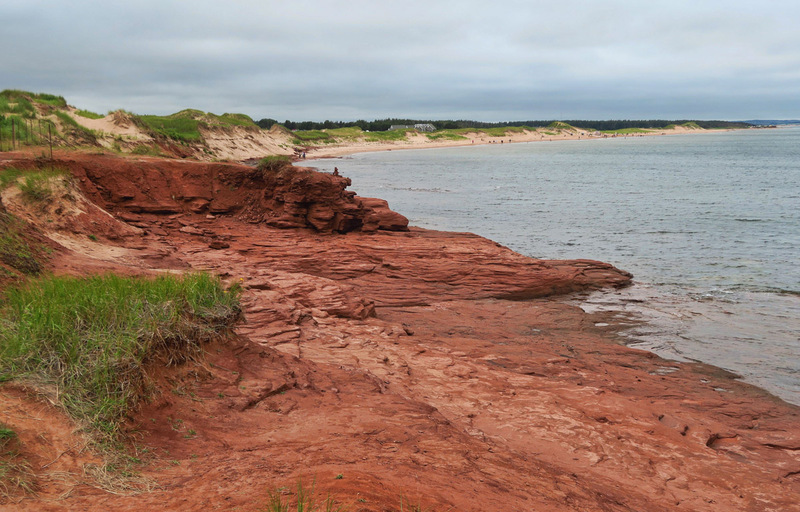 The second reason is for the long expanse of beautiful red sand beaches, some of which make up PEI’s one and only National Park. 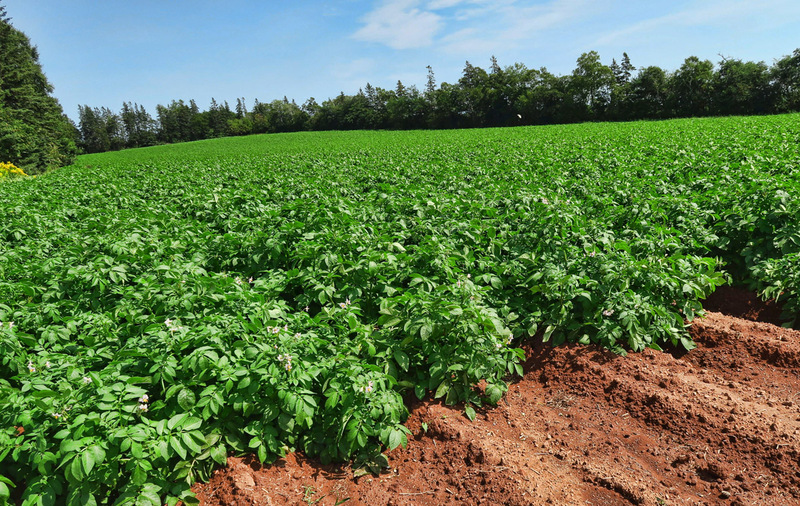 The third reason to visit is if you have an odd curiosity about potato farming, as PEI produces 25% of Canada’s potatoes. And the fourth reason would be “All things Anne.” For those who may not know (myself included up until now) the 1908 novel, Anne of Green Gables, which sold 50 million copies was based on Prince Edward Island. A large museum complex bears the title. I had mild curiosity, but no one attraction was calling to me. Okay, well, maybe the mussels. 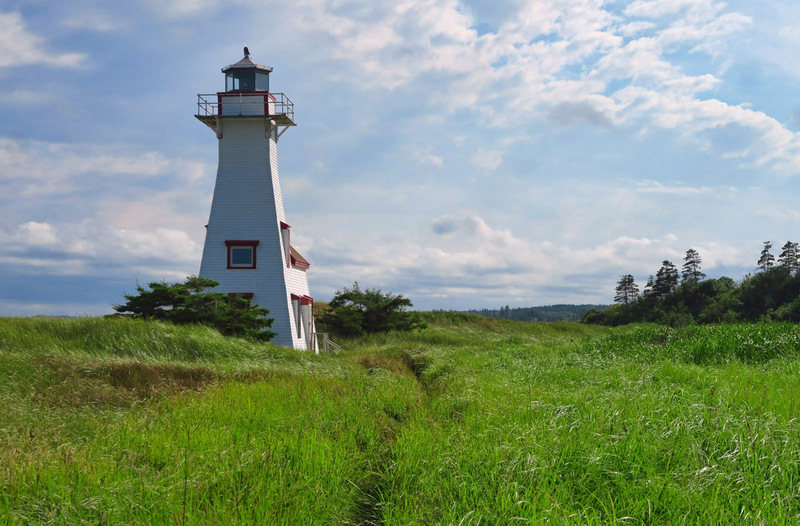 There are two ways to access Prince Edward Island. 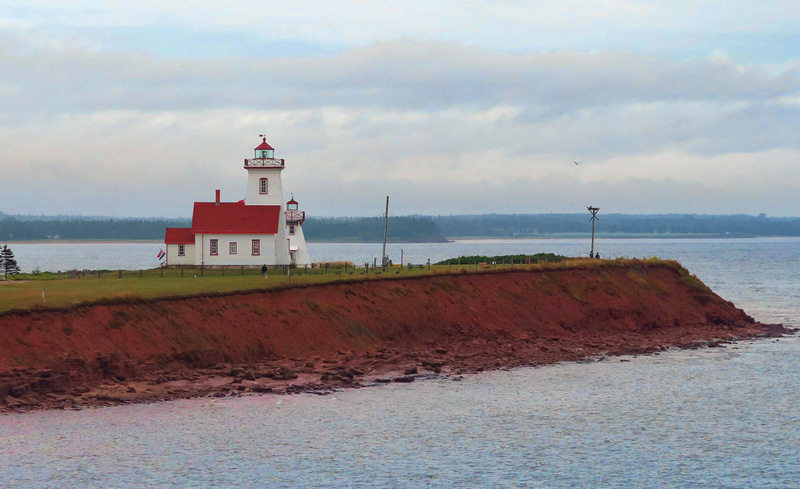 One can go by ferry from Caribou, Nova Scotia, or via the Confederation Bridge, an eight mile span across the Northumberland Strait to New Brunswick. In both cases, you only pay when you exit the island. Since the ferry is more expensive than the bridge, I chose to enter via ferry, and exit across the bridge. The scenery through the interior of the island is serenely pastoral. Rolling green hills, terraced potato fields edged in borders of brilliant yellow canola blooms. 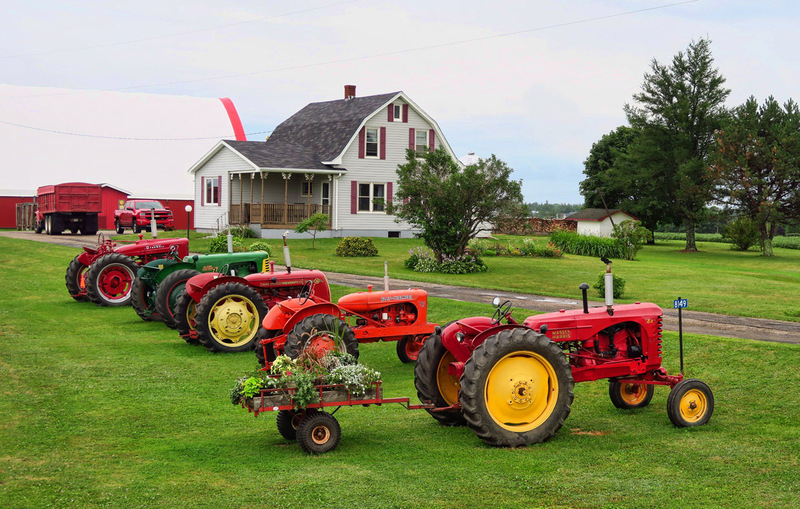 Steeply gabled farm houses punctuated by bright polka-dotted flower beds sit squarely in the middle of the fields, surrounded by farm equipment indicative of the independent farmer. The peaty, iron smell of the freshly plowed rust red soil reminds me of making mud pies in the red sandy dirt at my grandmother’s house. 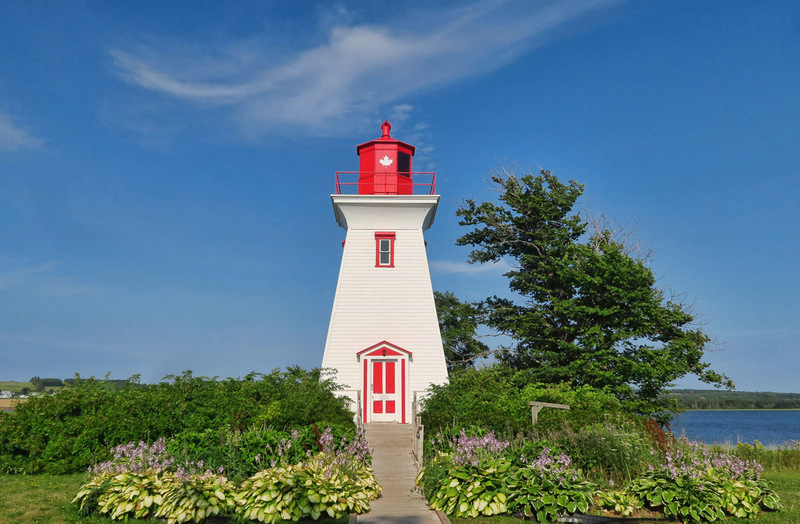 Not having one specific attraction that I want to see here, I decide to make my focus the lighthouses, knowing they would likely bring me to some scenic coastal areas. 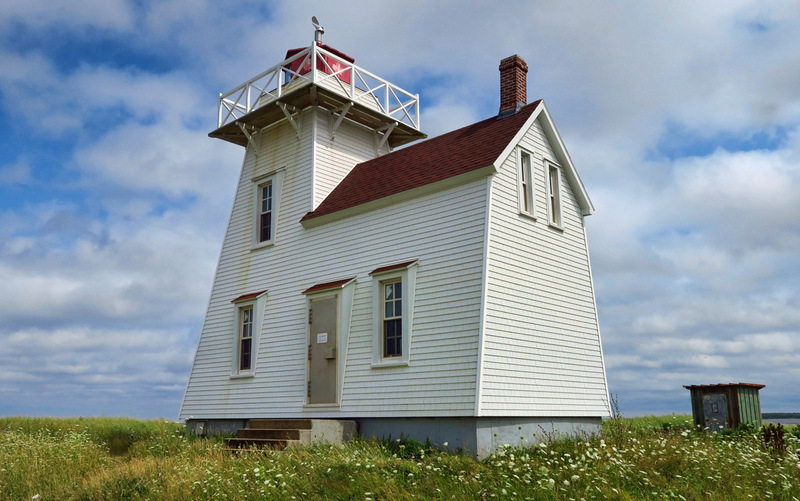 However, I soon realize that the PEI Lighthouse standard, white clapboard squarely flared towers trimmed in red, topped with a lone white maple-leaf all start to run together. It’s like an Easter egg hunt for the same egg. 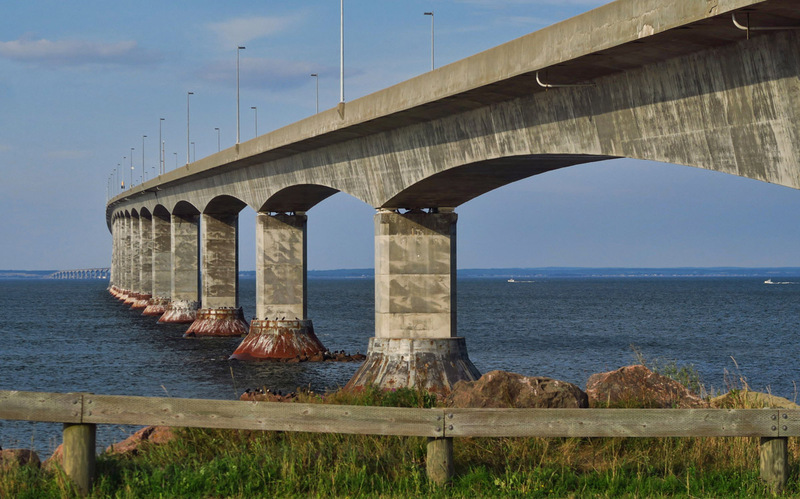 So after a couple of days of driving the ribbon roads, my craving for mussels now satisfied, I make my way toward the Confederation Bridge bound for New Brunswick. 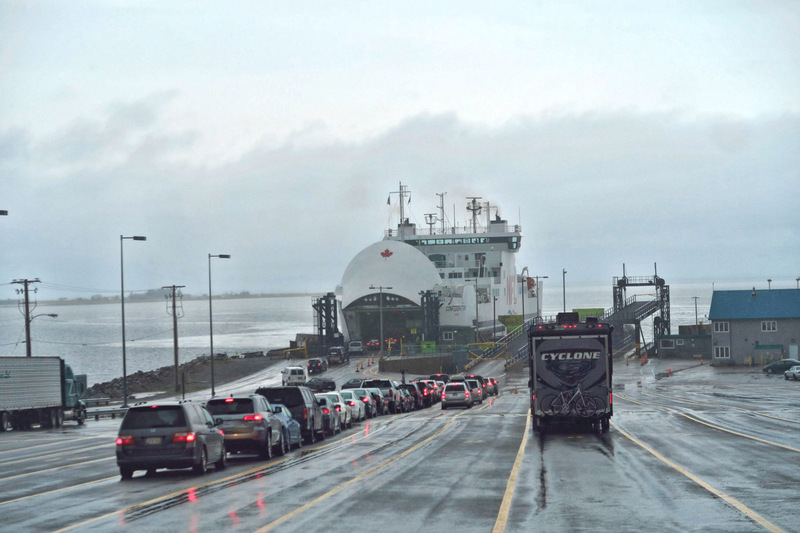 Boarding the 75-minute ferry from Caribou, Nova Scotia to Wood Islands, Prince Edward Island, No reservation required. First sight of landfall coming off the ferry, Wood Islands Lighthouse. Pastoral scenes driving across the island south to north. 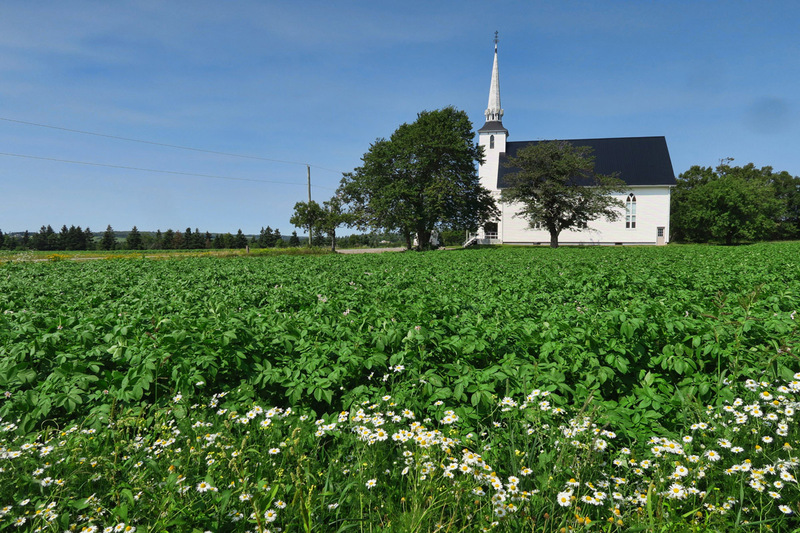 Potato fields dominate the scenery, as PEI produces 25% of Canada’s potatoes. Sacks of potatoes sold on the honor system along the roadside. 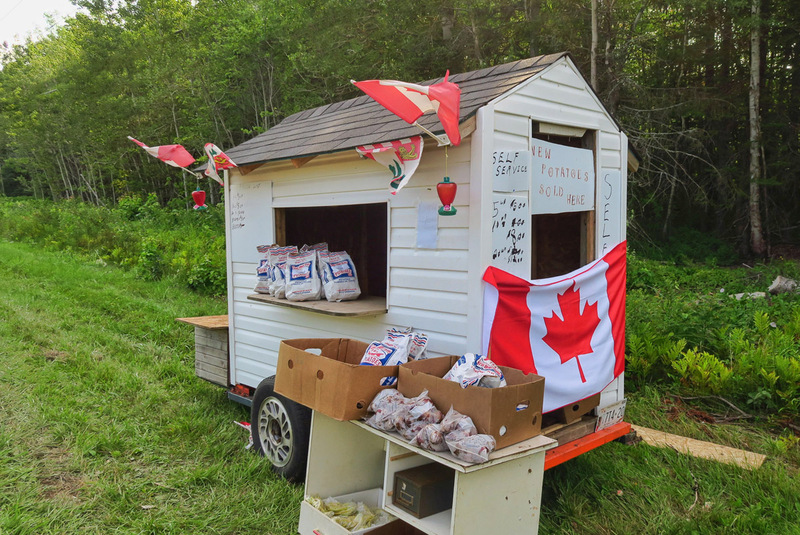 I still can’t believe the US Border Control did not make me surrender my PEI souvenir. 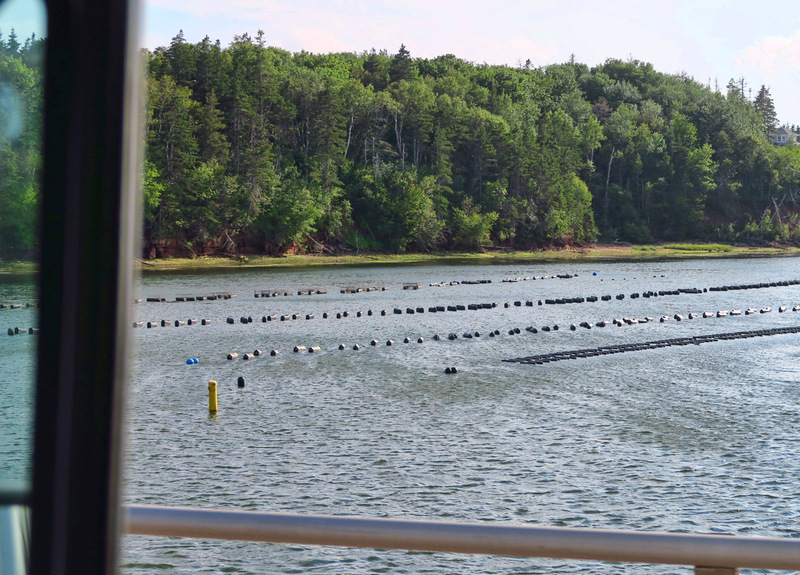 Although PEI is known for an abundance of fresh seafood, they are best known for their PEI mussels. A drive-by shot over a bridge where they are cultivated. Don’t miss the Blue Mussel Cafe! It was so good, I went there twice! The friendly owner is a delight. He’d never owned a restaurant before, and now he is #1 on TripAdvisor. They were every bit as tasty as I had anticipated! 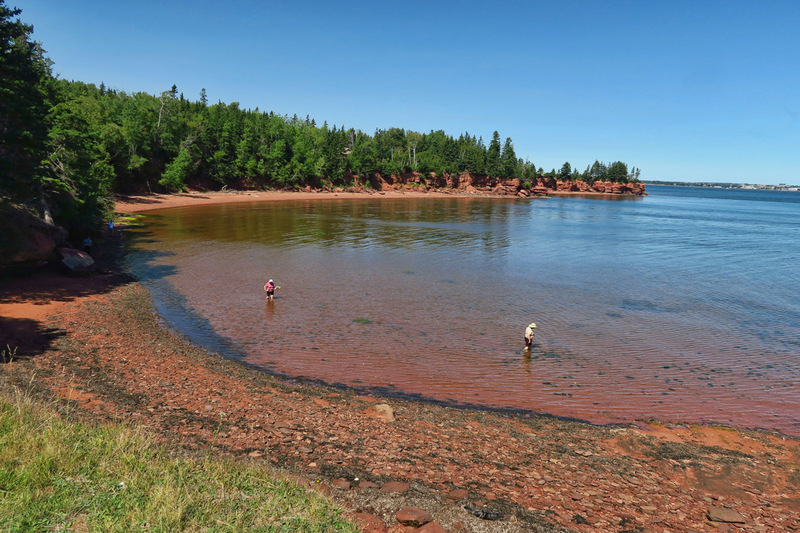 PEI is also known for both white and red sand beaches. Here you can see both, with white in the background and red in foreground. 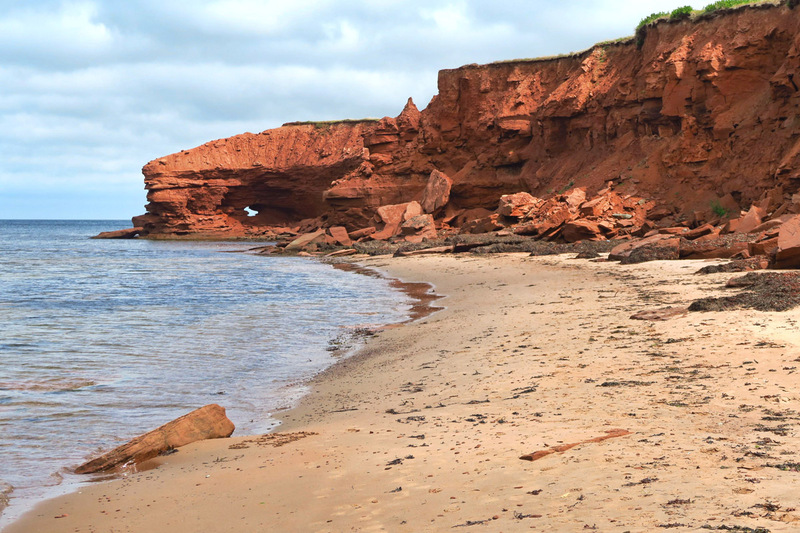 The best known of the red sand beaches is Cavendish Beach inside PEI National Park. 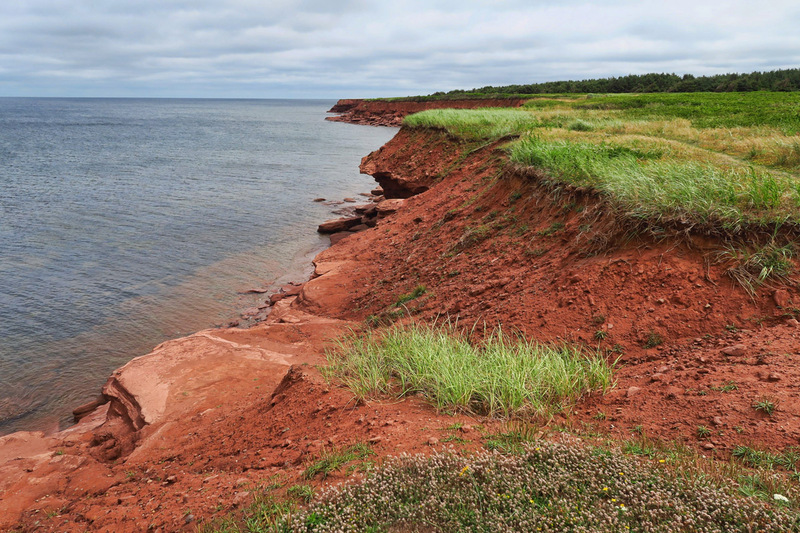 Due to the Northumberland Strait’s shallow depths, PEI boasts of the warmest waters north of the Carolinas. 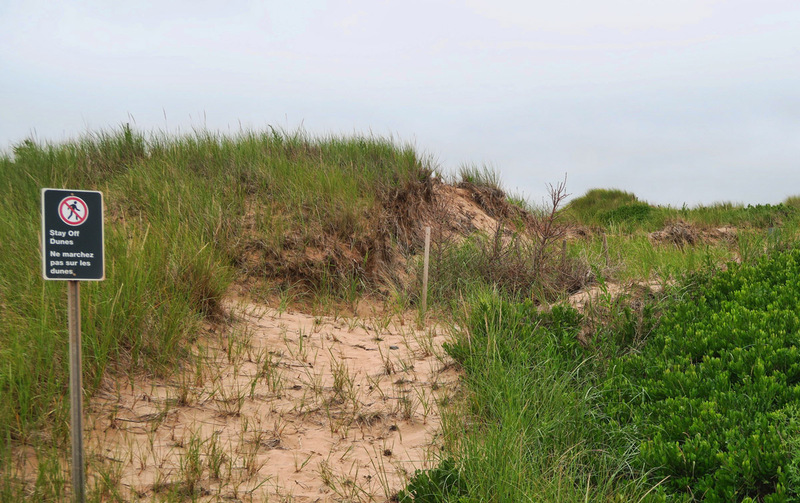 PEI has a project underway with volunteers from the local High School to protect the eroding dunes. They use recycled Christmas trees to trap the shifting sands and discourage climbing on the dunes. 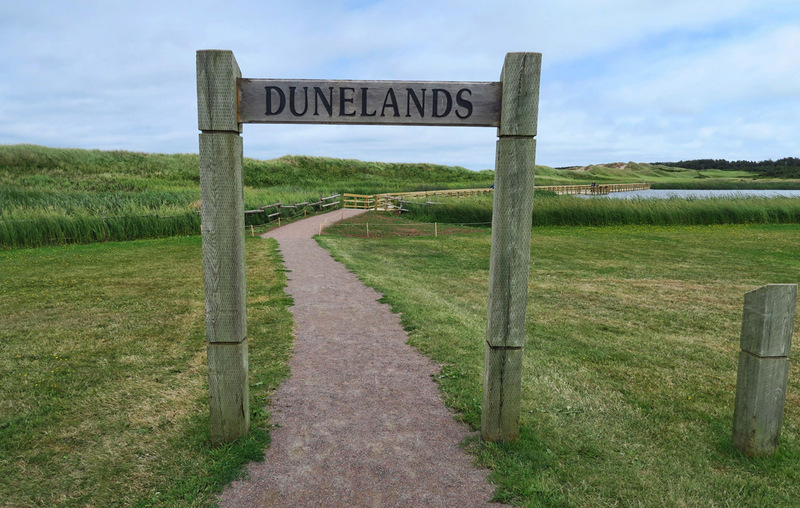 Walking paths through PEI National Park. 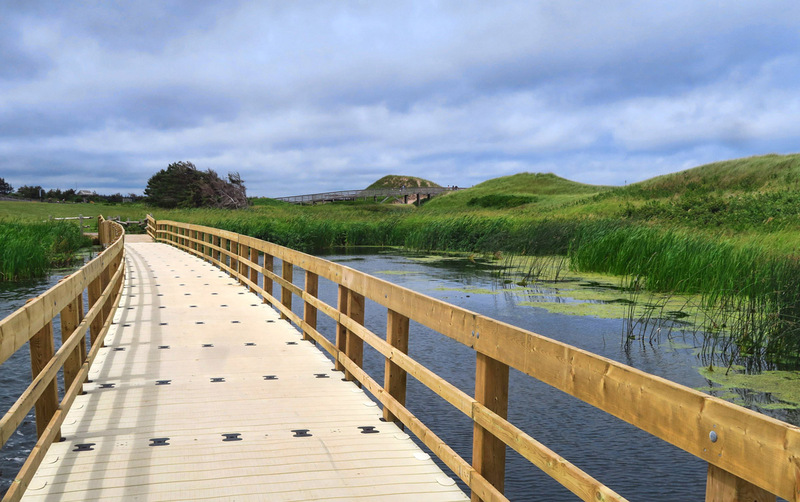 A “floating boardwalk” along one of the National Park trails. 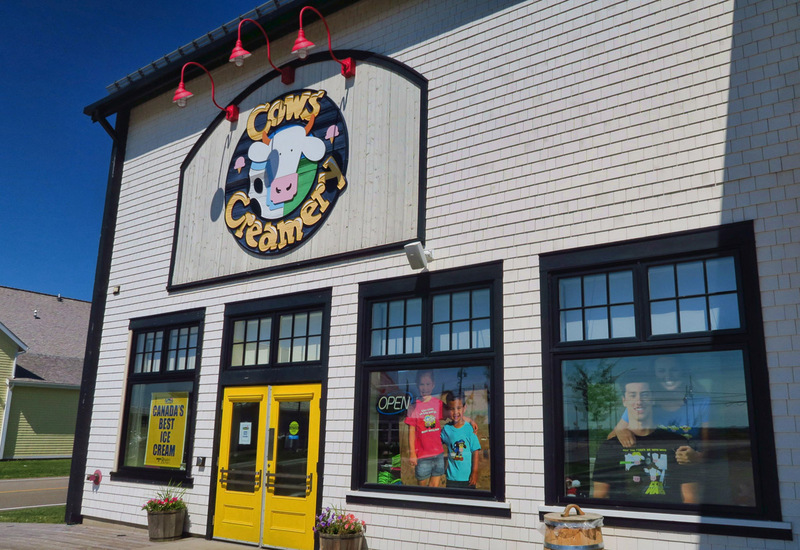 While known for their dairy products, Cows Creamery is also famous for their tee-shirts featuring the culture of the common cow. 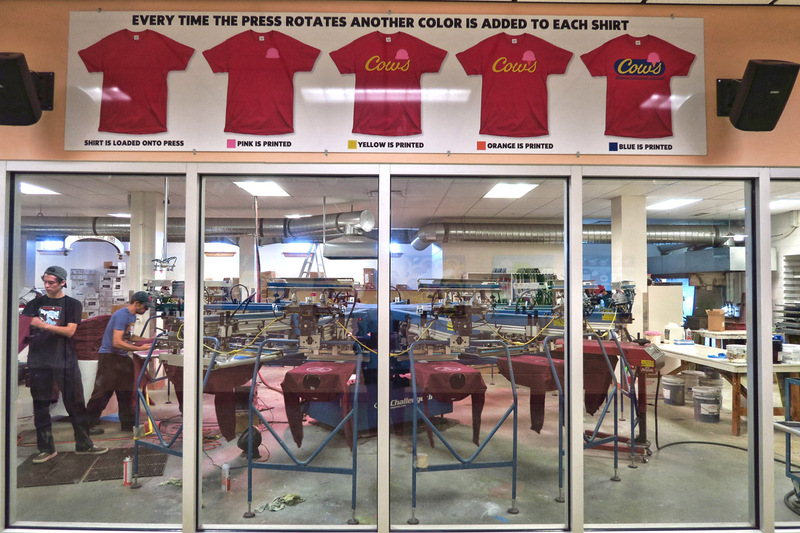 Tee-shirts are printed in house, and are part of the self-guided factory tour. One of Cows Creamery’s tee-shirt designs. 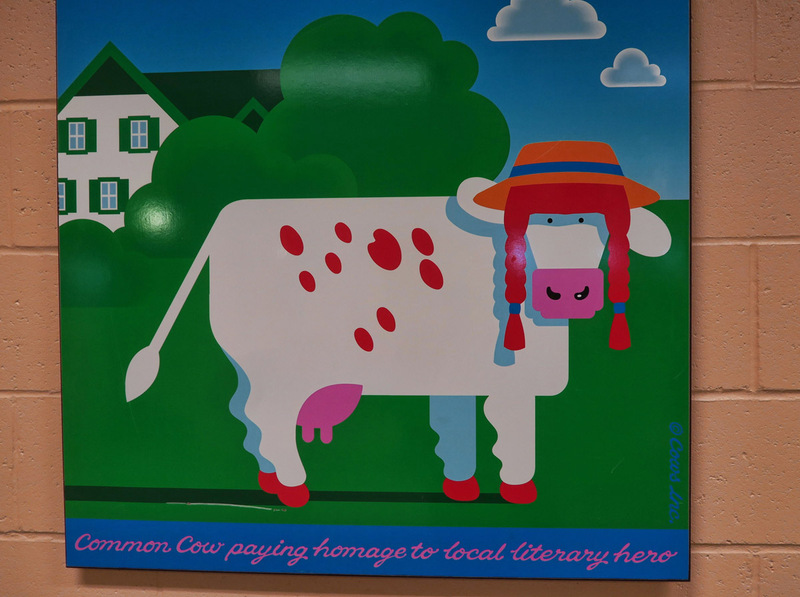 The caption reads, “Common Cow paying homage to local literary hero,” Anne of Green Gables, of course. 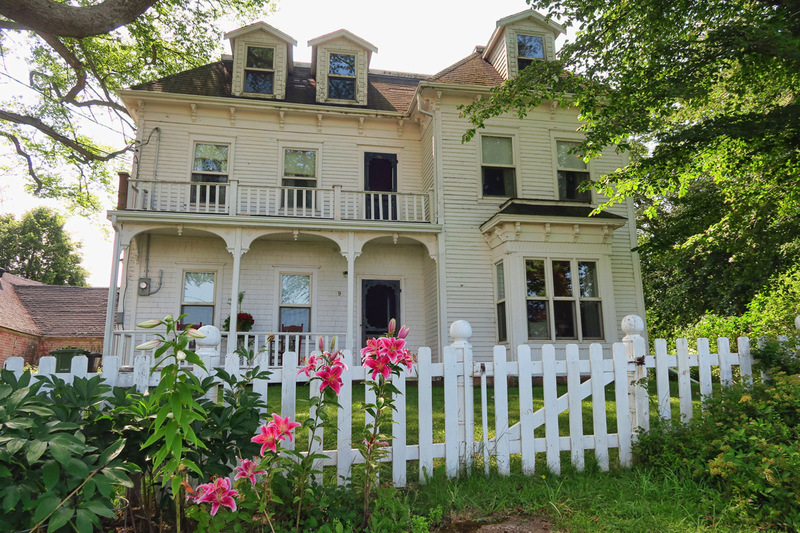 If you are a fan of Anne, you might be interested to know this is the birthplace of the author, Lucy Maude Montgomery, born 1874. 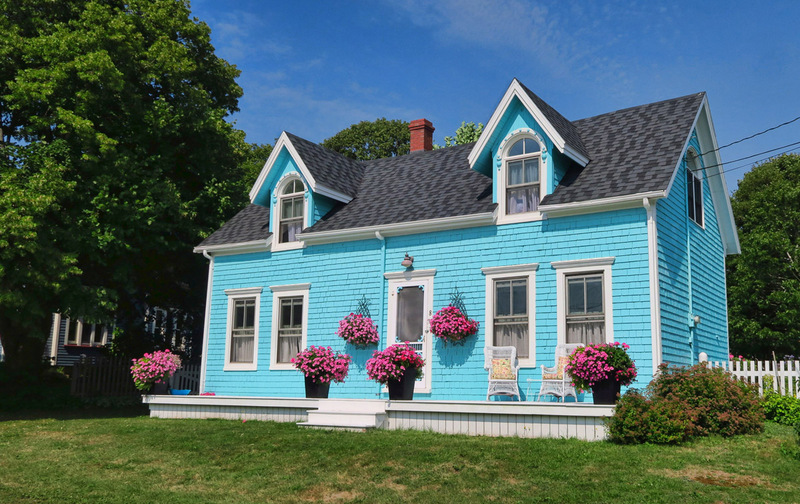 One of the many beautiful homes in Victoria-by-the-Sea, a historic town along PEI’s south shore. 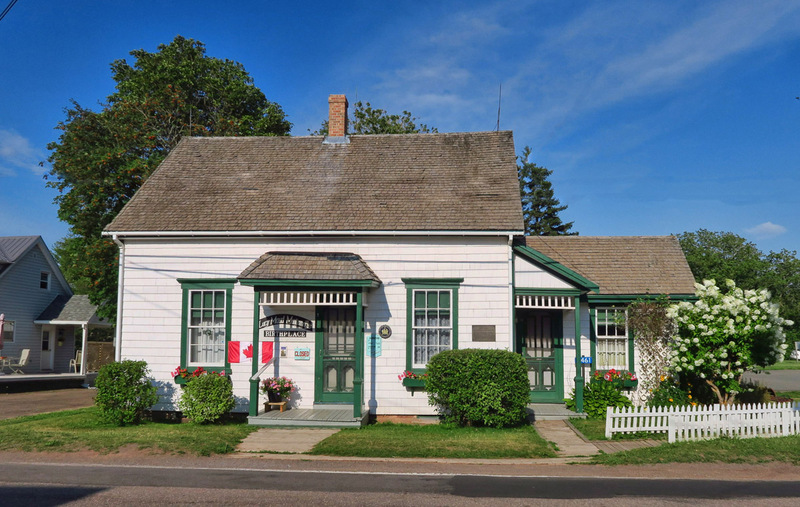 The picturesque little village with its shops and waterfront restaurants is a popular but quaint tourist stop. 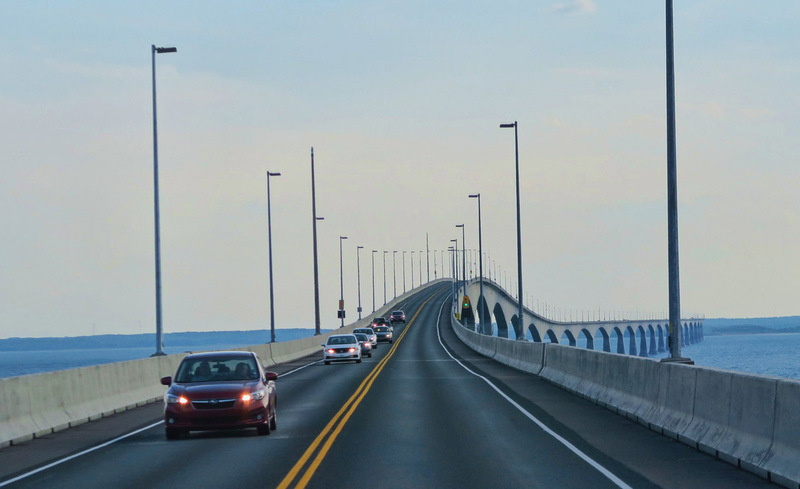 Crossing the 8 mile Confederation Bridge over to New Brunswick, which carries the Trans-Canada Highway. Prior to completion in 1997, the only way to access PEI was via ferry. 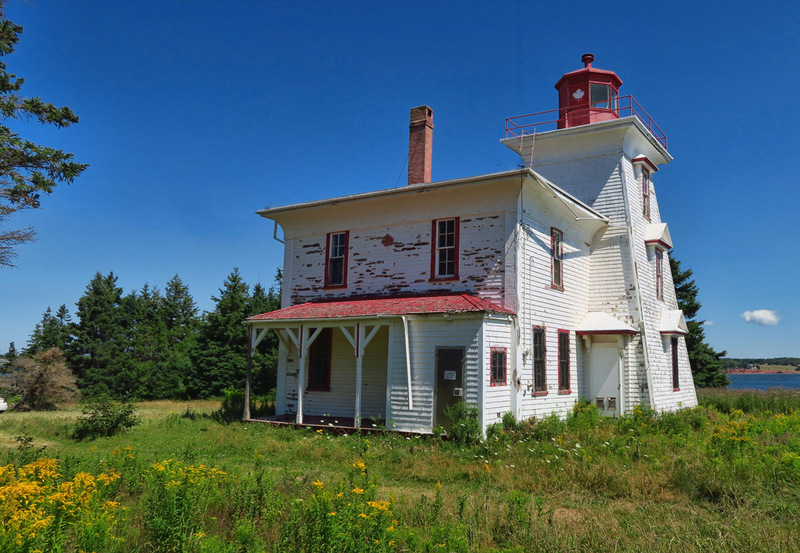 This entry was posted in Canada, National Parks, Prince Edward Island and tagged Blue Mussel Cafe, Covehead Harbour Lighthouse, New London Lighthouse, North Rustico Lighthouse, Northumberland Ferry, Prince Edward Island National Park by Suzanne. Bookmark the permalink. PEI mussels are world renown but they cannot beat the lesser known, but much taster, Newfoundland mussels. For my money Newfoundland also produces more female mussels which are the tastiest and generally biggest. My wife had mussels at Nicole’s Cafe in Joe Batts Arm on Fogo Island and swore they were the very best she ever ate… She’s still talking about them. As you know we were there a few weeks ahead of you and the potato fields were just being planted . All the fields were that beautiful rusty red color and now when you were there they are a lovely green. I feel dumb! We were in PEI and knew nothing about the mussels, didn’t eat a single one. Guess we’re going to have to go back. It is a beautiful and bucolic part of the world. The PEI mussels are so darn good. I was buying them for $.99 a pound. We had five pounds every night during our visit. They are so easy to prepare. 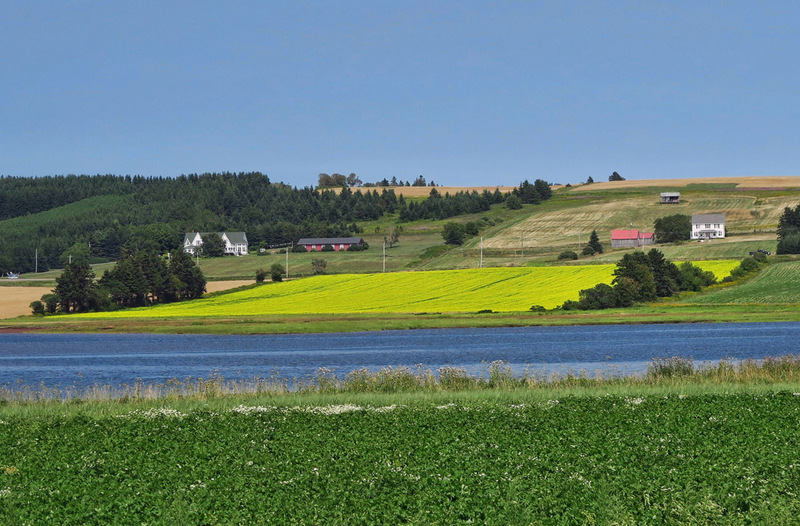 I also loved the brilliant, yellow canola fields dotting the scenery. We tried to spend the month of July out on one of the very popular peninsulas with red beaches on one side and tan beaches on the other. We only lasted a week. It was sooooo windy and cold we had to leave. We were running our heaters during the day. The park gave us a full refund because they had a waiting list of locals. Glad to see you had time to make the tour around. The webcams on the Confederation Bridge are live. We called our kids on one side and told them to watch for us as we crossed. They both saw us!! Very cool! PEI was a favorite for us. Such wonderful people. I wish you’d gone to a ceili. They are really wonderful. Right up there with the mussels. Thanks for the beautiful pictures of this lovely island. Glad you took the ferry one way. Hi, Sherry — Thanks for the comment. I actually did end up getting to go to a ceilidh on my way back through Nova Scotia, in the village of Baddeck at St Michael’s Hall. I learned how to distinguish a jig from a reel. Not only entertaining, but educational as well! After looking at your photos and reading this post, I am thinking we need to arrange for a trip. 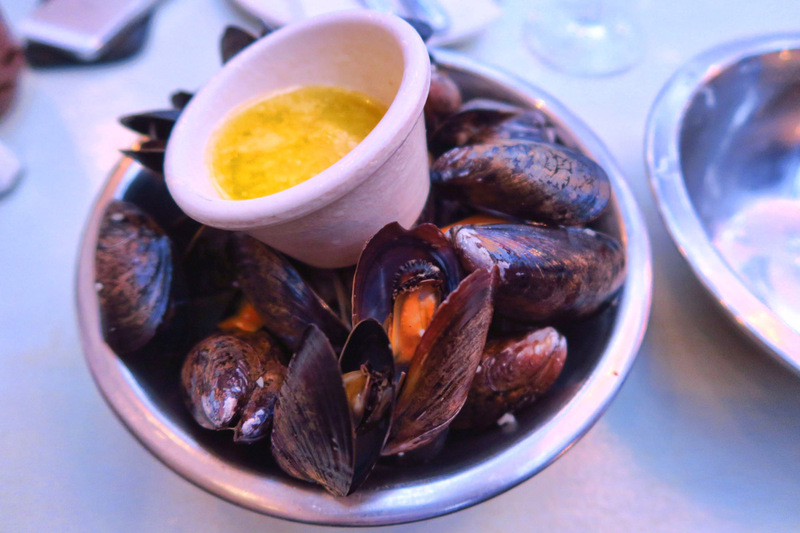 Those mussels are calling my name! Great post Suzanne! My mom’s favorite book of all time is Anne of Green Gables, she has the doll and read the book , seen the movie a million times. That would have been her highlight, mine would be the mussels! I love your posts and pictures ! Where are you headed now?